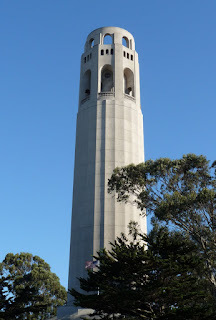 Coit Tower holds one of, if not the, highest points in the city (I think at the top of it you probably would be the highest point you can be), and I've seen it from afar for years, but I've never actually driven up to its parking lot until today. With Bunny, Joe, and Lauren riding along, we headed up to the highest peak to meet up with my parents and Teenie before dinner. They were looking for the world famous "Parrots of Telegraph Hill", but the parrots weren't around this evening. We'll just have to come back to the city to find them sometime. We all went to Kitaro for dinner (delicious as usual) and this afternoon Bunny and I watched a Mystery Science Theater 3000 movie "Overdrawn at the Memory Bank," which involved personalities being put into a baboon, and the movie Casablanca all over a weird, campy, 90's sci-fi movie...but the commentary was pretty great. Back again to Tire World!